Hello and welcome to New Arcana. If you're reading this, most likely you are very new to the site and require some help. Never fear, this thread is aimed to assist you. Please read carefully first, but never be afraid to begin asking questions. The following existing moderators and admins by the creation of this thread are: Philemon (also Nyarlathotep), Gran-Mom, Jerry, Noah, Paige, Deshi, Zavie, and Maria. For starters, please feel free to introduce yourself to the rest of the membership. The Introduction Board is a good place to do so. Please make a thread and do so. Other members may post in it to also greet you. But most importantly, please log in at the Chatbox. It will become your most primary method of communication with the rest of the membership. 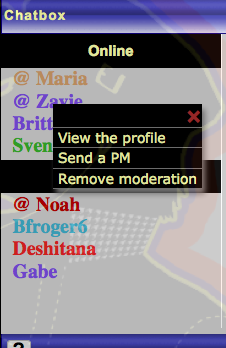 Or when you're logged in chat and then you can right click on it for options. Once you do that, click on View the Profile. 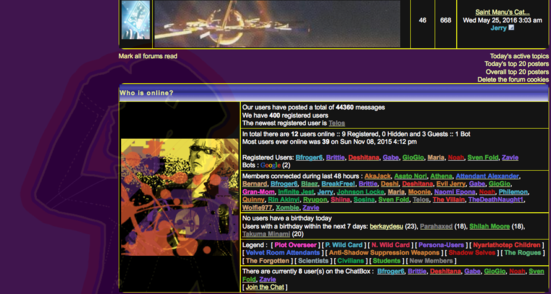 Upon clicking, you should see a similar layout of the member you wish to contact through PMs. Now click on Contact. Now you'll see something similar like this where the PM button should stick out like a sore thumb. Click on that and the rest should be self-explanatory. Now. It should be noted that while we can contact on the site, we also contact each other through Skype. So feel free to share your skype information if you wish. It just makes it easier for you to be more accessible. Now we have established introductions and communication. We move on the more important stuff you have to know. I refer you to the Quick Links. They are located to the left margins of the site. Please refer to each and one of them. You will need them to get an idea how this site works. Oh and the Q&A Board is evidently where you ask questions and get answers. So please feel free to use it. 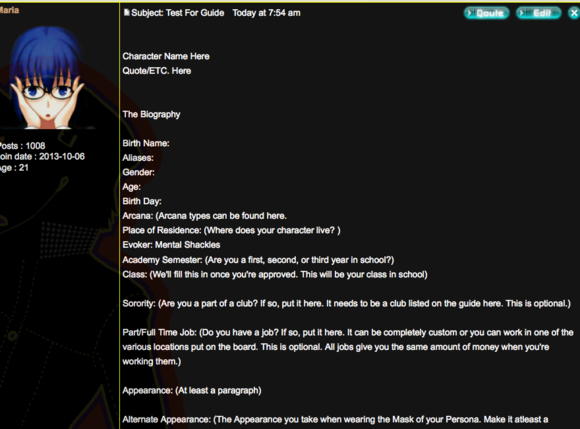 But more importantly, click on Vital Information. While it contains the links, there are more that you should know about. Please refer to them. But do avoid threads that contain titles with Old And Obsolete. You may wish to refer to the Staff Room and the Updates And Announcements boards for any other information. I understand that there is a lot to read, but please make an effort to. If you wish to take part in the site, that much is expected of you. But we are all willing to help you. So please don't give up and don't be afraid to ask for help. Now we're getting to the biggest reason you're here. Creating a character begins with... well, Character Creation. Should be pretty self-explanatory. You'll have to create your character first. And then your Persona. 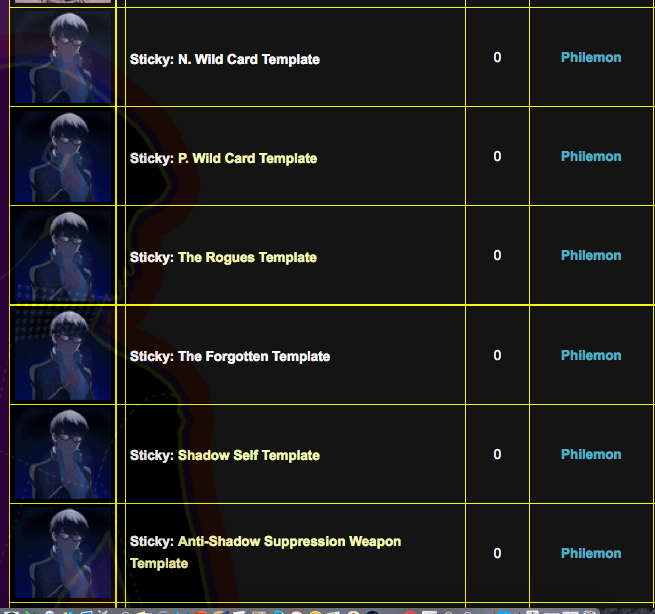 But do remember, there are templates that you must choose to use upon entering each one. 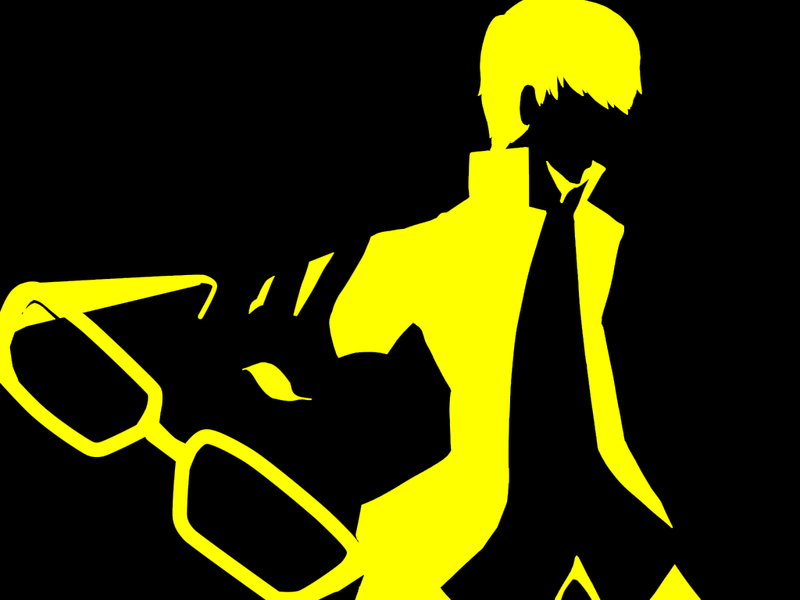 If you have been looking around on the threads in Vital Information such as The Character Types, you should be able to see there are other Character Classes than Persona Users. As a beginner, it's suggested that you go for a Persona User, but you may choose whichever class you like. But please, when you are using the templates, please copy and paste the content at the bottom of the template page. It allows you to ensure your template is the way how you see it in the page. Or otherwise without the coding, you won't have it. This is what will look like when you don't do it. Once you have finished making your Character and the Persona, please wait for Staff to grade and please follow what they say on their critique. It's to help facilitate your character's inclusion into the plot. The final section for this brief tutorial. We all get social links by RPing with characters and with NPCs. They have their own benefits. 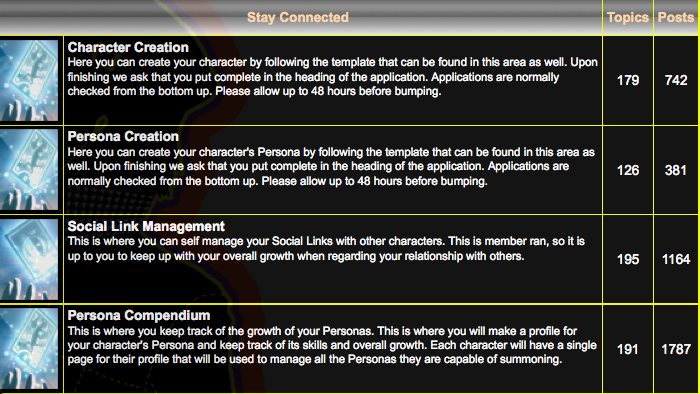 But that's for you to find out by entering the Social Link Management section, be sure to read the Sticky for basic information on it. The Persona Compendium keeps track of the progress of your Persona's growth in power, your equipment, your money, and exchanges with the markets. And that should be it. Hopefully this will help you get on your feet. If you have any other questions, please ask. And once again, welcome to New Arcana.